If you want the full tutorial, hop on over to my original post. This is a really easy project. All you need is some sort of chain with bezels/blanks (this one came from Michael’s, and last time I was there, I saw that they still carry them), flat-bottomed glass gems from the floral dept, a heavy-duty permanent adhesive (like E6000), your graphic, and some Mod Podge. A note: the glass gems you get from the floral department aren’t perfectly round, nor are they perfectly flat on the bottom. So if this is what you use, expect a few bubbles. Personally, that doesn’t bother me at all – it’s my opinion that it adds character, but I know a less-than perfect look isn’t for everyone. So if you prefer a smooth and bubble-free look, you’ll want to order smooth glass tiles, or try Mod-Podging to the top of something small (what about Scrabble tiles?) and add some dimensional glaze to the top. You can achieve a similar look with a lot of different mediums! I saw this bracelet on pinterest and came to this website for finding the instructions. Amazing and beautiful idea!!! And I m even happier that I came here because this website is amazing!!!! So many gorgeous ideas, can’t wait to discover them all!!! I cannot find the bracelet with the blanks! No luck at Michael’s store, no luck at AC Moore and no luck using Google! Does anybody know where I can get these? What a beautiful creation! Oh my! 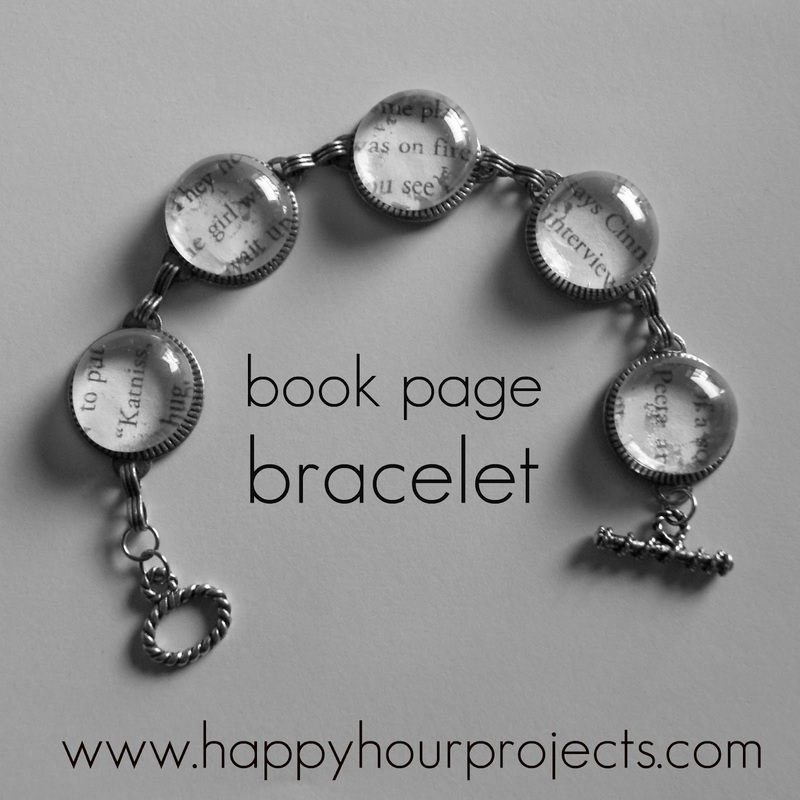 This is the cutest book page bracelet ever! Awesome! You know, if you don't smooth out the bubbles really well when you Mod-Podge it onto the underside of your glass, you will still have a little “roughness”. You could also smudge it with a little bit of ink if you're careful. I'd love to see photos when you're done – feel free to visit the Happy Hour Facebook page and post your photos anytime! I thought that might be it and since I am not using circles I had to order the square glass which is perfectly clear :(, I wonder if I could find a way to grunge it up- I do like that look much better! I am using the Hunger Games books! I am also making the necklace you have in another tutorial with the real or not real quote and I ordered a Mockingjay charm for really cheap to hang on the chain with it! Thanks so much for both tutorials I have been searching for something special to give my daughter for her birthday and she is going to LOVE these!!!!! This is great, I am trying it now (only with a bracelet that has square blanks I could not find circles even though I wanted circles). How did you get the paper to look old? Also did you shrink when copying? I do not like how my scanner/printer reprints the pages. However, at our local landfill, there are different stations for dumping items. Recycling area, paints, oils, etc. One area had stuffed animals and PILES of books. Many of them were missing pages or covers and was really in bad shape. I took home a few pages from a dictionary from 1978 and an old encyclopedia set that was missing chunks of pages, (I also took all of the stuffed animals to wash and fix to donate to the children's hospital here). Then I find out that Bazzill card stock comes in something called Antique Book Papers. These have old books printed on really nice papers, they also have reprinted vintage newspapers. No more trips to the dump for me! Your pretty bracelet is a feature this week! I am now on book 2. I am about half way through and am having a hard time getting anything else done….., but read. I LOVE your bracelet and will be featuring it tomorrow at our party. Whoohoo! Big time fan! Just finished the series last week and I can't wait to go see the movie. This bracelet is so cool! You're being featured today at Mom On Timeout – thanks for sharing! Dropping by a second time to let you know I am featuring your project on this week's Inspire Me Monday – congrats! Can't wait to see what you're working on this week! I have not read the book but look forward to the movie. Your bracelet is beautiful. Just hopped over from the Shady Porch…this is so cool! Great idea! Would you like to link this at my link party at http://imaziet.blogspot.com ? I LOVE Hunger Games. What a net idea for a piece of jewelry! LOVE THIS!!! I am going out to buy these supplies today Can't wait to make one of these!! 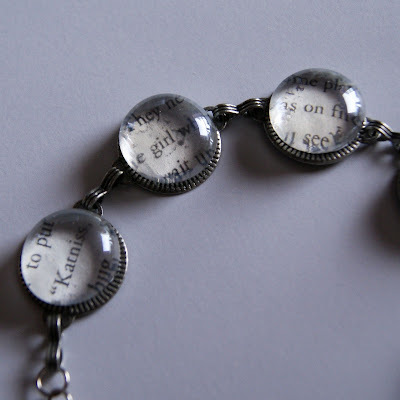 I love anything with book text and I love unique jewelry pieces!! Love that bracelet! Found you from the Linky Followers blog hop! Hope you can follow me back at http://www.lucasandmahina.com! I am late getting on this Hunger Games bandwagon, how embarrassing, lol. Love your bracelet though and using stuff from your stash is so satisfying!! I like this idea and your book necklace — very nice! This and the necklace turned out so cute!! I just started the Hunger Games and am already IN LOVE! you did a beautiful job on this love it. wow! This turned out so cool! I love it! Love it! Just seeing the glimpse of words in the bracelet take me back to particular parts of the story!! I just finished re-reading them! So excited for the movie! I keep telling my husband that he has to read them but he has yet to do so…. Congrats for using your stash. I am a huge supporter of the economy and love to shop more than I care to admit – so when I use up what I have I too feel a sense of accomplishment! This is a great way to wear what you read. My house is eagerly awaiting The Hunger Games too!